All this week we'll be taking you behind the scenes at Novelicious with guest posts from Team Novelicious. Now, we hear from our gorgeous reviewer Kirsty Nicole Pole. The first book I ever reviewed for Novelicious was Christmas At Tiffany’s by Karen Swan and it was posted on Friday 25th November 2011. I will never forget that feeling of excitement as it arrived through my letter box and then the feeling of responsibility as I dived into the pages. It has been 3 years since that first review and I still get that squiggly feeling of excitement in my tummy when I see new books arrive, all shiny and unread; ready for me to discover. 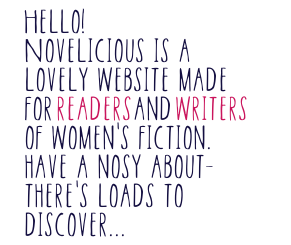 I discovered Novelicious after I emailed Kirsty and asked her if I could place an ad on the website - I had recently left my job as a Bookseller and moved into freelance Editing and was aiming to drum up a bit of business. Kirsty couldn’t have been more helpful, she placed an ad on the site for me and we began chatting about books and our mutual love of romantic fiction. It was a few weeks later when Kirsty mentioned that she was looking for new reviewers and would I be interested? Interested?...I nearly bit her hand off! I wrote a practice review and boom, I became an official part of the Novelicious team and the rest, as they say, is history. All this week we'll be taking you behind the scenes at Novelicious with guest posts from Team Novelicious. Now, we hear from our discerning contributor and roving reporter Amanda Keats. It was the lovely Hannah Ferguson, fearless literary agent, who first showed me the Novelicious way. I was interning at the Marsh Agency and getting experience working in editorial. She told me about the site, that they were looking for fresh blood, and that I should apply. I sent over a few links from my own blog reviews and Kirsty got in touch to say she wanted me with her on the team. I was sent lots of lovely new books to read and started reviewing them as fast as I could. Somehow, after giving a few books less than respectable marks under 5/10, I developed a reputation of being very hard to please. There was a bad run as I recall when I was actually quite scared they would never improve! Since then, however, many have managed 8/10 or 9/10 and I’ve even given a few highly coveted 10/10s! Occasionally, I’m called on to put my interviewer hat on. Over the years, I’ve asked questions via email and over the phone. It’s been incredible and I’ve had the pleasure of chatting with Jodi Picoult, Jane Green and many more over the years. I had already met Jane Green at her book launch so when we spoke over the phone, while she sat in a hotel room, it felt like we were already old friends. We laughed, we chatted and the time flew by. By sharp contrast, one of the worst interviews I’ve conducted was probably Jodi Picoult – and that had nothing to do with Jodi herself who was refreshingly honest and really interesting. On this occasion, technology failed me and in trying to get the conversation recorded over the phone, I somehow managed to hang up on her! That, after finding a room at my day job I could hide away in in order to conduct the interview. There are a lot of four-letter words in the bonus recording I did on my dictaphone. You never can be too careful! All this week we'll be taking you behind the scenes at Novelicious with guest posts from Team Novelicious. This morning we hear from our wonderful resident cookery writer Helen Redfern. I feel jolly lucky to write for Novelicious. After all, how many freelance opportunities offer three of my favourite things: books, writing and baking? For my Feasting on Romantic Comedy posts every week I choose a food that has made my mouth water from a novel or a film. It could have been mentioned fleetingly, or it could be a fabulous, mouth-wateringly descriptive passage. I’m not fussed either way but it does have to add something to the story for me to write about it. Often this ‘research’ is the most time consuming part. When I find a cake or bake mentioned in a novel I shout hurrah! and it is all systems go. I start to work out a simple recipe - again, more research – this time from the internet or my huge array of recipe books. Once I’ve scribbled down some ideas I then move away from my desk into the kitchen and start to experiment. All this week we'll be taking you behind the scenes at Novelicious with guest posts from Team Novelicious. Here we have the second ever Novelicious team member and deputy editor Debs Carr. I can’t believe this fantastic site is five years old already. My role for Novelicious.com is dealing with requests for reviews, interviews, writing room posts, etc for Alternative Thursdays. I keep a spreadsheet showing all the posts I’ve set up going back over the years – can you tell my day job is as a company/trust administrator – and correspond with PR people and publishers co-ordinating future posts. They send me requests for reviews, interviews or other slots that they’d like to be included in and I let them know if their book is something that I feel suits the Alternative Thursday slot and what we need for each post in the way of jpegs, word count, and such. I arrange for review copies of the books to be sent to a team of reviewers. I ask for the reviews to reach me by Saturday, so that I can set up the posts for the following Thursday. Jennifer Joyce is my main reviewer and sends me weekly reviews. I also have a team of reviewers whose posts I alternate – we post two reviews each Thursday – and Amanda Keats sends me a piece if she’s been to a party, book-signing, or any special book-related occasion. One of my most exciting Novelicious experiences was taking part in the judging of the Novelicious Undiscovered Competition and reading hundreds of entries, some of whom were amazingly talented. Over the years we’ve celebrated with each other when members of the team have been signed up by agents, received publishing deals or self-published their own novels. All this week we'll be taking you behind the scenes at Novelicious with guest posts from Team Novelicious. First up we have our fantastic contributor (and recent Sunlounger author) Cressida Mclaughlin! I used to pour over every post of Novelicious, sneaking peeks at work, retweeting all my favourite interviews and reviews, and anything that encouraged and inspired my own writing. When Novelicious launched the fantastic Novelicious Undiscovered competition in 2012 I had to enter. I was one of the 20 finalists and, having my work showcased on the site led to me finding representation with my agent. After the competition was over, I knew I wanted to be a part of the site, so when Novelicious advertised for new reviewers I jumped at the chance. While I’ve been with Novelicious I’ve read and reviewed some fantastic books, organised the Book Deal Moment and The Book That Changed my Life features, been to some lovely launch events and met some of my favourite authors. I’ve also been allowed to witter on about some of my favourite books, which, once I get going, can be a bit of a dangerous thing.